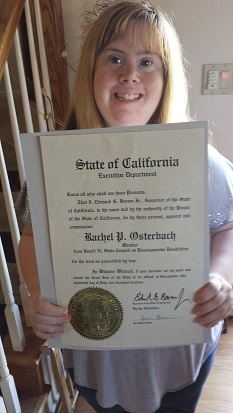 The Down Syndrome Association of Orange County is THRILLED to share that our very own Rachel Osterbach has been appointed to Area Board XI of the California State Council on Developmental Disabilities. Rachel Osterbach, 31, of Fountain Valley, has been appointed to Area Board XI of the California State Council on Developmental Disabilities. Osterbach has been a mailroom assistant at Scottish American Insurance since 2011. She was a store assistant at T.J. Maxx from 2010 to 2011 and an office assistant at Allstate Insurance from 2005 to 2010. Osterbach is a charter member of the Toastmasters Gavel Club and a global messenger at the Special Olympics Southern California, where she has been a member since 1993. She is a member of the Down Syndrome Association of Orange County. This position does not require Senate confirmation and there is no compensation. Osterbach is a Democrat. We are so very proud of you, Rachel! We look forward to watching you make a positive impact in your new role.